More of a challenge than a magic trick, the Knot in the Handkerchief trick will still establish the magician as a man of rare talent. Perhaps after dinner the magician makes a wager that he can take a handkerchief or dinner napkin and tie it in a knot without letting go of either end in the process. Once a doubter has taken him up on the wager, he offers them first go. Around the table the napkin passes, each person trying to tie a knot in it with out letting go of either end and failing. Finally the napkin is passed back to the magician, who lays it out on the table and rolls it up in a rope-like fashion. Crossing his arms, the magician picks up the ends and with a flash reveals that he has tied it in knot! The key is the starting position of the arms in this trick. No advance preparation is required, making this a perfect pub or after dinner trick. This is one of the class of “magic tricks” that are a bit more like puzzles than illusions, but from the very beginnings of magic, magicians have challenged “normal men” to contests they can’t possibly win, but at which the magician seems to breeze through without any trouble at all. 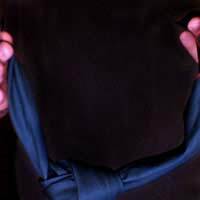 This Knot in Handkerchief has a secret that will be revealed as soon as the trick is done, but should still reinforce to the audience that the magician is a person of special knowledge. The magician twirls up a napkin or handkerchief as he announces a wager - that he can tie this napkin into a knot without letting go of either end in the process. The magician holds up the napkin in a normal fashion, each hand grasping an end and the napkin stretched out in front of him as he asks if there are any takers. Once the doubters come out, the magician passes the napkin around and allows them each to try. When all have failed and the napkin is passed back to him, the magician makes sure the roll is nice and tight and lays it out on the table in front of him. Then the magician crosses his arms, reaches down and picks up one end of the napkin in each hand, holding it by the finger tips. At this point the magician only has to uncross his arms. The ends of the napkin will draw through themselves in a natural fashion to create a knot once the arms are uncrossed. The magician should immediately toss out the knotted cloth to the doubter for a laugh. While this trick is “ruined” the first time it is shown, it is still great for a laugh and will win a wager at the same time. Easy to learn, this trick still requires enough practice to do properly before showing it - from there, the rest is acting and having fun!